Three Rivers Volkswagen is a community-oriented VW dealership in McMurray, PA, that's here to take care of all your automotive needs. Whether you want to buy or lease a new Volkswagen, browse our selection of pre-owned VW cars and SUVs for sale or schedule Volkswagen service, you'll be treated like family when you step onto our lot. See all the wonderful reasons why you should buy from Three Rivers Volkswagen, then schedule a VW test-drive to meet with our expert sales staff. Don't settle for anything less than the top-notch sales and service you deserve at our Greater Pittsburgh Volkswagen dealership. 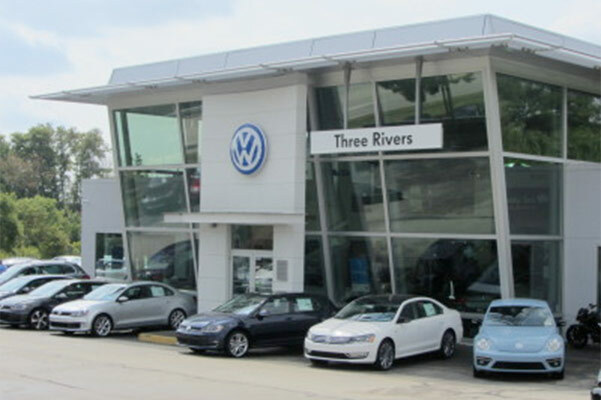 Three Rivers Volkswagen offers A Different Dealership, A Better Experience. Our Pennsylvania VW dealership has a huge selection of new Volkswagen models for sale, including the VW e-Golf. We're conveniently located for Western PA drivers, and our dedication to the community goes far beyond VW sales and service. We donate to the Humane Society and routinely host adoption events in our showroom. We also give back to the Washington City Mission and we even make a donation to a nonprofit organization in your name when you purchase a vehicle from us! So, if you're looking to learn more about your Volkswagen e-Golf lease options or want to buy a Volkswagen Jetta or Passat, you'll find the help you deserve at Three Rivers Volkswagen. When you buy or lease a vehicle from our VW dealership, you'll receive exclusive perks like free alignment checks and lifetime tire rotations. Our extensive inventory includes the full lineup of new Volkswagen models for sale, including the VW e-Golf, Tiguan and Passat. Buy or lease a new, used or Certified Pre-Owned Volkswagen at a price you're sure to love. Our VW dealership is designed to be your one-stop shop for Volkswagen sales, service and financing. You deserve expert financing and world-class service, and that's exactly what we provide at our McMurray VW dealership. We understand your schedule can get busy, which is why we're open late during the week and offer convenient Saturday hours. Our Volkswagen service department employs Volkswagen Master Technicians, ensuring that your car or SUV is in good hands when you bring it in for VW repairs or maintenance. Schedule VW service online or stop by for Volkswagen Service Xpress, no appointment necessary!